This torso of Buddha, sculpted in the characteristic pink sandstone of the Mathura region, epitomizes the style of the workshops of this school during the Gupta period. The perfectly symmetrical, frontally represented, standing figure formerly projected in very high relief from a slab of the same material. 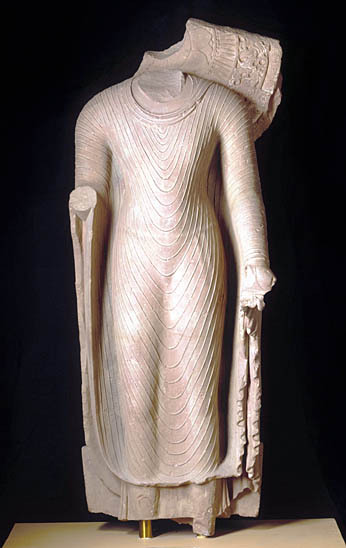 The Buddha-nowadays headless-displays a particularly sensitive modelling specific to effigies in this style. The characteristic silhouette, with its broad shoulders, narrow hips, sturdy arms and long, slender legs visible beneath the robe, already corresponds to a certain classical canon. Moreover, the ethereal body with its rippling muscles is clothed in a thin, transparent, monastic uttarasanga robe. The drapery is given a “clinging” treatment, revealing the contours of the antarasanga undergarment. The missing right hand was no doubt originally represented in the symbolic “abhaya mudra” gesture, indicating freedom from fear. The head of the Buddha was formerly encircled with a large halo, a fragment of which- decorated with floral and pearl motifs against a background of lush foliage- is still intact over the figure’s left shoulder. The purity of form, harmony of proportions, skilfully executed bust, and virtuoso treatment of the robe and halo make the piece the very archetype of Buddhist sculpture from this period, perpetuated down through the centuries in South East Asia, Tibet, and as far as China and Japan. In India, the Gupta style left its mark on the classical and post-classical periods which flourished between the 4th and 8th centuries CE. The Gupta period was the “golden age” of Indian civilization and witnessed unprecedented florescence of all the arts. In sculpture, two schools and two styles- Mathura and Sarnath- prevailed by reason of their outstanding quality.